Mystic, Sufi Master, Zen Teacher, Peace Activist, Horticulturist, Scientist, Madzub: Samuel L. Lewis has been called these things and more. The originator of the Dances of Universal Peace was a spiritual renaissance man whose life and teachings were a testimony to truth, originality and embodied spirituality. Though rejected by polite society and even his own family because of his spiritual leanings, Samuel Lewis remained true to the penetrating spiritual vision of human liberation at the core of his being. His life, often difficult, bore much fruit for his students and for the world. 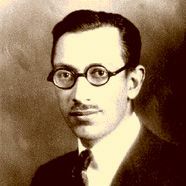 Born October 18, 1896 in San Francisco, California USA to Jacob Lewis, a vice-president of the Levi Strauss Company, and the former Harriet Rothschild of the international banking family, young Samuel was a precocious and brilliant child who from an early age showed strong interest in mysticism, past lives and psychic phenomena. Despite his family's efforts to encourage him toward a life of material pursuits and business success, he was invariably attracted to spirituality. Though he graduated with honors from San Francisco's top high school, his wealthy family refused to send him to college because his values were so different from theirs. Samuel encountered the teachings of the Theosophical Society in 1915 at the World's Fair in San Francisco. The universality of Theosophy, of seeing the religions of the world as different rays of one truth, resonated deeply in him, and Samuel continued to study world religions voraciously. In 1919 he met and began what would become a long association with Rabia Martin, Hazrat Inayat Khan's representative in the United States. Around that time he also began formal Zen training with Nyogen Sensaki, a Rinsai monk and one of the foremost early teachers of Zen in the United States. From then on Samuel's spirituality took a decidedly deeper turn. In 1923 he had the first of several audiences with Sufi Inayat Khan and received initiation from him. Later in life Samuel would express his conviction that he received regular psychic messages from the late Sufi master. During the depression years Samuel lived a simple life as a gardener while becoming involved with social issues, including world peace. He lived at the Sufi Khankah called "Kaaba Allah" in Fairfax, California and began writing essays on spiritual themes. During World War II he worked as an historical consultant and secretary for Army Intelligence. 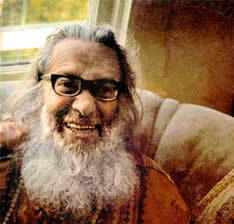 In 1956 he traveled to Asia, which exposed him to spiritual practices and realized sages in the East. On his travels he was widely accepted as an awakened being by the spiritual communities he visited. This cultural and spiritual stimulus furthered the development of his ideas. 1960s because no one else was doing it. In the upsurge of interest in Eastern spirituality of that period, Zen, Hindu meditation and many other practices were available, but not Sufism. Murshid Sam would offer a full week’s program of dharma talks, Dance classes, Walks in astrological yoga and the Sufi gathas, and during the 1960s a growing group of disciples gathered around him at his home in Precita Park, San Francisco. Often feeding his students meals from his own table, he said that his peace plan for the world was to "Eat, Dance and Pray together." 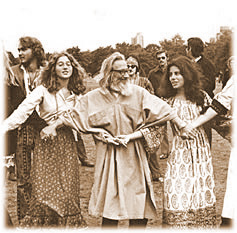 From his rich life experiences Murshid Samuel Lewis envisioned and created the Dances as a dynamic method to promote "Peace through the Arts." From the early days and his original body of about 50 dances, the collection has grown since his passing in 1971 to more than 500 dances, which celebrate the sacred heart of Hinduism, Buddhism, Zoroastrianism, Sikhism, Judaism, Christianity, Islam, and the Aramaic, Native American, Native Middle Eastern, Celtic, Native African, and Goddess traditions. His work continues through the teachers of the Sufi Ruhaniat International, the order which Murshid Sam founded, and through the Dances of Universal Peace International Network. 1 Excerpt from Samuel Lewis’ paper Spiritual Dancing, circa 1940. Full paper is available in the Resource Library of this web site. 2Spiritual Dance and Walk, 1990 PeaceWorks International Center for the Dances of Universal Peace, p. 12. 3 Transcription from the film Sunseed, by Frederick Cohn 1973. 4 Letters of Samuel L. Lewis, July 28, 1970. MurshidSam.org - Esoteric papers, commentaries, diaries and 64 recorded talks of Murshid Sam are available on this site. Mansur Johnson's book Murshid: A Personal Memoir of Life with American Sufi Samuel Lewis, PeaceWorks Publications, Seattle, Washington 2006.